Illustrated here is G8, the best green one I have at the moment. This has silver wheels. The green paintwork seems unmarked and the green rails are nice and shiny with no obvious chips - one of the better examples. The handbrake and horn are in place. The screen is original. 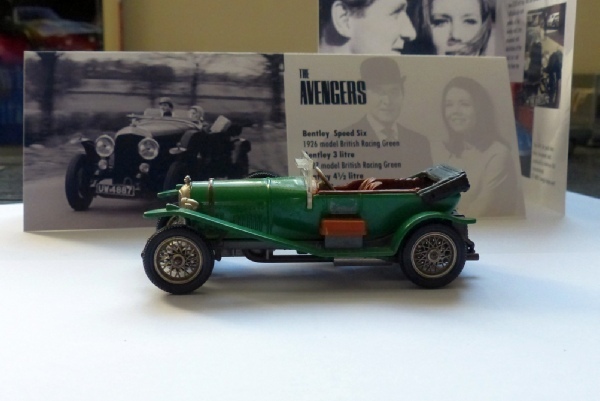 This is the better match for colour as Steed’s Bentleys were all green, albeit a bit darker. This one started as a 9001 Le Mans racing edition and has had its number transfers removed. There is also a small amount of paint missing where the Union Flag was originally affixed on the passenger door.